Why Choose HSys Medicaid Billing Software? HSys Electronic Billing Software for Medicaid & MCOs gives you the quickest, easiest way to manage your client information, submit your HIPAA-compliant electronic claims to Medicaid & MCOs, receive priority payment, manage accounts receivable, ensure compliance, and integrate with your other software applications. 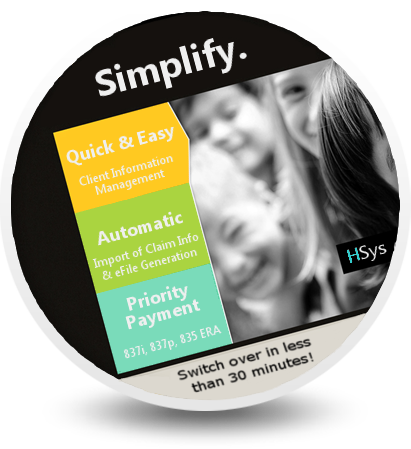 Plus, you can make the switch from your current system and be billing with HSys in less than 30 minutes! With HSys, easily store and maintain all client demographics, their ICD9/ICD10 diagnosis codes, any recurring CPT Procedure Codes, Medicaid & MCO billing info...everything you need to know about your clients, all in one place. At a glance, also see full account and ledger information for any client (charges, payments, adjustments, denials, rebills, etc.). When you're ready to make the switch to HSys, we'll import all your current client and billing info for you, set everything up, and you'll be billing in less than 30 minutes. If you already capture or enter your daily service information into another system (like EVV systems, timecard software, SalesForce, Annkissam, L.A.S.T., or some other internal or CRM software), HSys can automatically import all that information (clients, dates, procedure codes, quantities, etc.) for you in just seconds! No need to double-enter any information, or waste any time reentering claims for Medicaid & MCOs. Generate HIPAA compliant 5010 837i (institutional) and 837p (professional) certified and approved electronic claims, or even 270 Batch Eligibility Request files at the touch of a button. Receive Priority PaymentHSys claims get paid faster! Medicaid & MCOs pay electronic claims before any paper claims, so electronic billing is a must for priority processing. Plus, doing your own billing in-house using HSys instead of using a clearinghouse saves you money, gives you complete control over your client information and accounts receivable, and validates everything before sending to Medicaid & MCOs to greatly reduce or even eliminate denials. Also, automatic importing and posting of payments from the 835 ERA (Electronic Remittance Advice) file takes only seconds, and instantly updates all client account ledgers and balances. 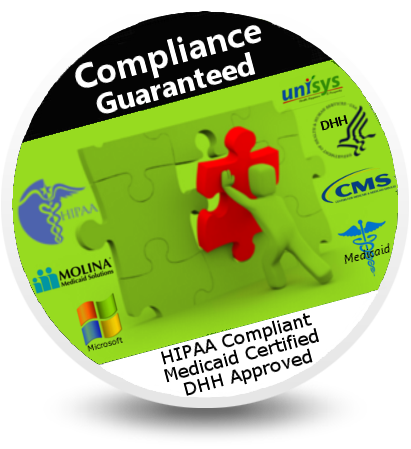 Ensure compliance with HIPAA 5010, Medicaid, MCOs, EDIFECS, Molina, Unisys, DHH, Microsoft Windows, and the rest with HSys -- guaranteed. 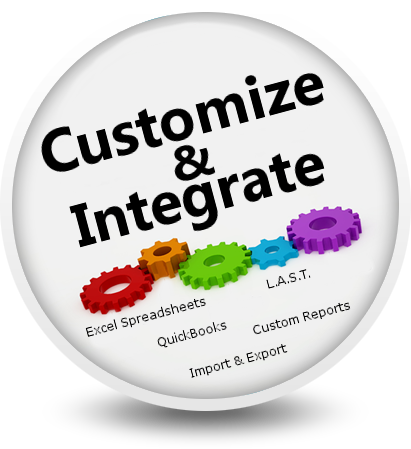 Add custom reports and spreadsheets whenever you need them, automatically import and export data in any required format, and integrate and share data with other applications like L.A.S.T., Excel, Access, Word, QuickBooks, Annkissam, SalesForce, and other accounting, reporting, EVV, and enterprise systems. "Being able to customize H-Sys to fit our needs, this system also acts as accounts receivable software for us, and we have been very pleased with its performance and the technical support provided to us these last 2 years. We were also able to develop reports that we needed for more detailed tracking such as PA reports, Denial and Rebill reports, as well as client ledgers by location and service code, etc." "The transition was very easy. The technical support is fantastic." "The transition to using the H-Sys software was very smooth, and the actual billing and submission is very easy. H-Sys is a great software package."